With the FRITZ!Box USB remote connection software, you can use a USB printer connected to the FRITZ!Box as if it were connected directly to the computer's USB port. Connect the printer to the USB port on the FRITZ!Box. Enable the USB remote connection for printers and the option "Printers (including all-in-one printers)". A connection is automatically established as soon as the computer sends a print job to the printer. Once the print job has been executed, the connection is automatically cleared and the printer is once again available to all computers in the home network. The automatic connection is only established when a print job is sent. Other functions offered by the printer cannot be used with this connection type. With a permanent connection, you can use all of the printer's functions (for example ink level display, fax or scan function). However, other computers in the home network cannot access the printer. Note:You can use both of these options if you select "automatic connection" for normal print jobs and only select "permanent connection" when you want to use a different printer function. Right-click the FRITZ!Box USB remote connection symbol in the notification area of the Windows taskbar (Systray). Enable the option "Connect printer automatically" in the context menu. If access to the FRITZ!Box is password-protected, enter the password and leave the "User name" field blank. If access to the FRITZ!Box is protected with a user name and password, enter the name and password of a user who is authorized to access the FRITZ!Box user interface. 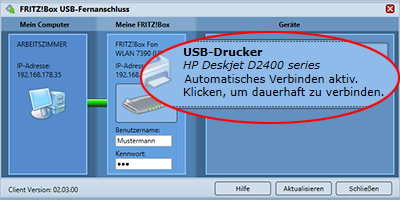 Right-click the USB printer that the computer should automatically connect to. Select the "Assign printer..." entry from the context menu. Follow the instructions in the "Assign printer" window on selecting the appropriate printer driver and then click "OK". Right-click the USB printer that you want to connect to the computer. Click on the USB printer to enable the permanent connection.